Atlanta, GA, August 6, 2018: Anuhya Kasam, a Junior at Northview High School, traveled internationally and met people from all over the world for her Girl Scouts Gold Award project. The Gold Award is the highest achievement within Girl Scouts and is the most prestigious award in the world for girls. More than 300 million people suffer from stress- caused depression, according to the World Health Organization. 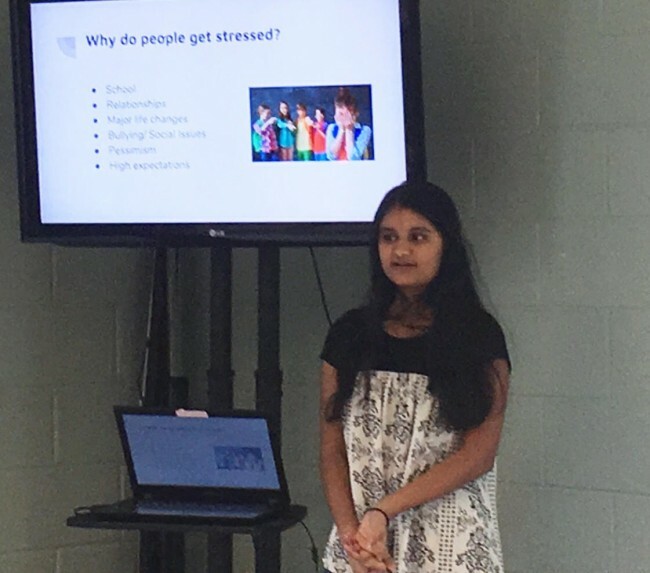 After gauging the stress levels of her high school peers through a school-wide survey, Anuhya found that 90% of her classmates are stressed everyday. Seeing these statistics, Anuhya decided to take initiative to solve the growing issue of stress; thus, project “DeStress 101” began. Anuhya also created several stress kits by raising $500 worth of materials. These stress kits include motivational films, books, stress balls, and stress- reducing games and items. These kits were sent to each of the previous workshop locations, so that the students can use the items in the kit during their frequent meetups. Over the course of one and a half years, Anuhya held six international stress- relief workshops for over 200 high school students, college students, and adults. These workshops were held in three countries:India,EnglandandAmerica. In each of these countries, Anuhya trained volunteers on how to conduct stress relief workshops, so that they would continue holding workshops even after she had left. She also conducted each workshop in the country’s language to make it convenient and friendly for the locals. 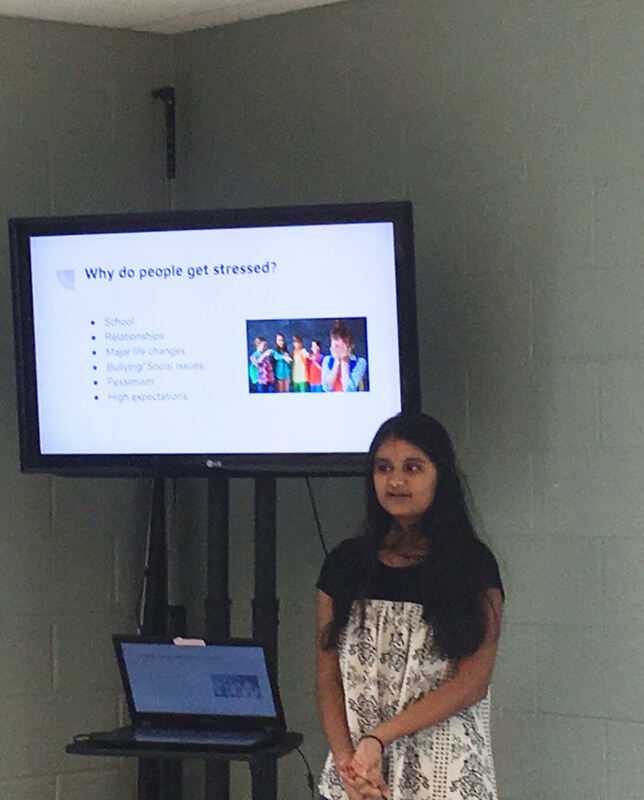 In these workshops, Anuhya and her team members taught stress management tips, quick stress busters, time management and organizational skills, and breathing techniques. The workshop ended with a meditation, calming the students’ minds and relaxing them. The six workshop locations were the Andhra Lutheran College in Guntur, KBN College in Vijayawada, Northview High School in Johns Creek, and community centers in London and Johns Creek. She was also selected to present this workshop at the Girl Scouts Volunteer Leadership Conference for adult volunteers. To ensure that the wonders of these workshops are accessible to more girls, boys, and their families, the DeStress 101 team members are continuing to spread these workshops through clubs and programs to other schools and colleges in several countries. Anuhya is also getting several invitations to present at national and global conventions. Through the ongoing inclusion of new volunteers, these workshops are reaching thousands of students. “Through my project, I had the opportunity to transform so many people’s lives. Being stress- free is so important in this modern day society, so I hope my project continues to inspire people to take control of their lives and minds,” Anuhya concludes.